Choosing the type of boat to buy is a daunting task for most people because it is not only a costly venture but one also almost entirely based personal interests. When buying a boat the first decision to be made is whether to choose a boat powered by a motor engine, a sail or by a person. Motorboats in their many forms, from powerboat racers to luxury motor cruisers, generally suit the boater who is more interested in exertion-free boating eased with modern comforts, and who has a reasonable amount of money to hand. Sailboats suit the more traditional boater who enjoys sailing’s unique mix of a peaceful and laidback lifestyle with an intellectual and physical challenge. Person-powered boats such as canoes and kayaks are ideal for those who don’t want to spend very much money and who are not afraid of a bit of exercise. The name motor cruiser generally refers motorboats that include on board accommodation and as such are usually used for holiday cruising. Prices for brand new cruisers vary from around £8,000 to well over £200,000, depending on the size and accommodation provided, whereas second hand vessels can be bought at prices upwards of £1,000. Recognised manufacturers of motor cruisers include Jeanneau, Broom, Sealine and Fairline. Dayboats are motorised cruising vessels without on board accommodation and as such are used for daytime activities such as trips to local islands or fishing expeditions. Some dayboats such as the Hawk 20 feature a sail as well as a motor that can be used according to the conditions. Prices for dayboats range from £1,000 for a used vessel from a boat brokerage to £60,000 for a luxury model. Powerboats are usually fast planing streamlined boats with a high power to weight ratio, which are used for racing. Models include the light and massively overpowered but hugely exciting and popular Zapcats and the Seadoo Sportsters, which both occupy the cheaper end of the market at around £10,000 to £20,000. Powerboat manufacturers include Bayliner, Maxum, Fletcher and Sessa. A Rigid Hull Inflatable Boat (RIB) is a vessel so named because of its rigid hull and upper inflated buoyancy chambers. RIBs are well known for having excellent handling and versatility and are very safe, an aspect highlighted by their use as rescue vessels. Manufacturers such as JCraft Ribs, Ribcraft Ltd, Sadler Ribs and Avon Inflatables Ltd, offer a range of vessels from 10 feet tender boats to large 30 foot offshore boats. Canal cruisers could refer to steel narrowboats or the Dutch barge style vessel. Narrowboats can cruise almost any waterway but they are not so well suited to tidal waters, unlike the Dutch barge. Buying one of these vessels brand new usually means they are built to order and so the styles and fittings can vary dramatically according to most tastes and budgets, whether they are traditional or use more modern materials. The name yacht cruiser usually refers to a sailboat that has on board accommodation and which is therefore used for long distance overnight voyages. These vessels also typically feature an engine, which is used to get in and out of a marina, off a mooring or when the wind drops. Yacht cruisers range in size from small 20 foot yachts such as the Jeanneau Sun 2000 and the slightly larger British Hunter 27 to the plus 100 foot super yachts such as the Swan 112. Daysailers are so named because they are sailing vessels designed for daytime use and not overnight voyaging. They are an ideal craft for a beginner sailor because they can be used to learn all the core sailing skills and are relatively cheap. There are numerous types to choose from, from monohulls to performance multihulls such as catamarans and trimarans. Models include the classic Laser dinghy, which is an ideal beginner’s class, the Mirror dinghy, the popular family daysailer, and the excellent all-rounder the Wayfarer dinghy. 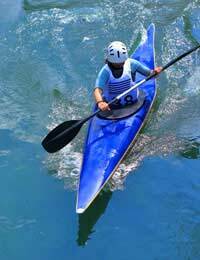 As Canoes and kayaks are not only small but human-powered they occupy the cheapest end of the market. Canoes range in size from 10 to 22 feet and accommodate between 1 and 3 passengers whereas kayaks are manned by 1 or 2 people. Prices for the boats generally range from between £100 for cheap second hand vessel to £2000. Just like buying a car or a house there are many aspects to consider when buying a boat to ensure that the perfect vessel is bought.